In the past few years, an awakening, through the ‘Arab Spring’, has focused on a political dimension of societal change. While the process of transformation begins with democracy, it does not end there. Though public uprisings have brought political changes, a new revolution is needed to transform the culture of learning. The failure of Arab education is a significant underlying cause of youth discontent in the region and has serious cultural, economic and political consequences. The status of the Arab world in science and education is unacceptable. Its contribution to international scientific research is insignificant and Arab universities do not regularly rank among the world’s 500 best institutions. It is remarkable that between 25 and 40% of the Arab population of 350 million remains illiterate, while adult skills in the digital age are now defined in terms of literacy, numeracy, and problem solving. In Egypt, which has the largest population of Arab countries, hundreds of thousands of students get a university education that is not compatible with the modern world. And, on the global market, there are no technological products “made in Arabia”. Thirdly, and most tangibly, the constitution should ensure that the budget for research and development is above 1% of the nation’s GDP. In light of recent revolutions in Egypt, Tunisia and elsewhere, these changes are possible. Such a pool of knowledge would help identify and provide solutions for fundamental problems facing society. Research into alternative energies, water resources, or drug design can bring numerous social benefits and rewards from the country’s economic growth and the participation in the global market. The landscape of funding and recognition in research also needs to be reformed. Today’s convention of using the number of publications to determine candidates for academic promotion has proven to be of little value and must be replaced with a framework to identify original and innovative contributions. Finally, there should be a strong link forged between the academic and industrial sectors to maximize potential mutual benefits from basic research and industrial interests, globally and domestically. In Egypt, the pioneering National Project for Scientific Renaissance, “Zewail City of Science and Technology”, was set up in 2011 to encompass these concepts in education, research, and the industrial impact. The project is funded by donations from the Egyptian people and the government. The third and last major component is the “Technology Pyramid”, which is responsible for commuting research output to industrial applications. It is designed to establish, with intellectual property protection, incubators and spin-off companies and to attract major international corporations to encourage a healthy climate for research-industry exchanges. In doing so, Arab nations will regain confidence to compete in today’s international science and globalised economy. It is gratifying to see several new centres of advanced education and research and development being set up in the region. By Ahmed Zewail & Sherif Sedky, published in Nature Middle East, January 9th 2014. 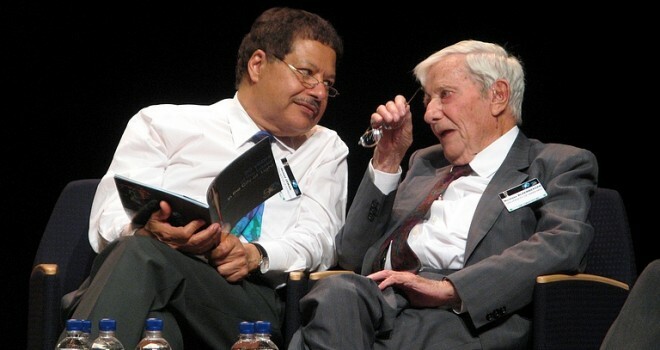 Ahmed Zewail won the 1999 Nobel Prize in Chemistry. He is the Linus Pauling Chair professor of chemistry and professor of physics at the California Institute of Technology (Caltech), and is currently the director of the Moore Foundation’s Center for Physical Biology at Caltech. He is also the founding president of the Zewail City of Science and Technology. Sherif Sedky is the founding provost of Zewail University of Science and Technology and the director of the Nanotechnology Center at Zewail City of Science and Technology.